From Delhi, the most practical mode of transportation to Dharamsala is by bus. There are two bus services (State and Deluxe) available. I opted for the deluxe bus ride. The ride to Dharamsala takes about 10 hours and goes through small, winding mountain roads. Before coming to India, I heard many horror stories of overtired bus drivers falling asleep while driving the long stretch to Dharamsala and of ill maintained buses breaking down on the route and travelers getting stranded. So I was more than a little bit concerned. I ended up getting a last minute ticket with my uncle in the back of the bus. The ride was the worst I ever took to this day! Leg room was non-existent, the bus of course had no Air Conditioning, the fans were broken, and the suspension in back needed repair. (Side Note: Always book a seat in-between the axels and not in back) Since the Deluxe bus price is more than double the price of the government bus, it makes me wonder what it'd be like to ride a State bus. After arriving in Dharamsala (actually McLeodganj which I refer to as Dharamsala) we walked up a small hill to drop my bags at my Grandfathers. I haven't seen him since I was 6 so we had some catching up to do. Unfortunately he doesn't speak English and I don't speak Tibetan so we communicated by learning each others' languages and the use of a translator from time to time. Dharamsala itself is not much of a city. While the Dalai Lama's temple palace along with the temple in the “little Tibet” town square is niceI wouldn't consider it marvelous. 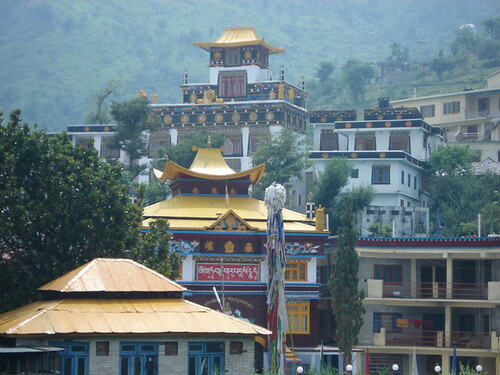 Lower Dharamsala does however have the Norbuling Learning Institute which is a remarkable temple that teaches young Tibetans cultural art skills. It being the summer and due to the fame of the Dalai Lama, Dharamsala is dirty and crowded with tourists, mostly hippies and ex-Israeli soldiers, who do one year India tours. The highlight of Dharamsala is the mountainous terrain. 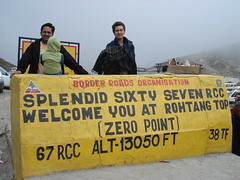 With my uncle, I went on a 3-day journey to nearby Triund. This is a hike that can be done by anyone in decent physical condition. It is recommended to bring normal camping supplies, however the journey can be done without, as long as you bring a little bit of money. Along the hike up, there are many cafes and at the summit you can buy food along with lending out a sleeping bag. There is also a fresh mountain stream where you can fill up on water. Luckily we managed to get a prime piece of real estate. We found a cave big enough for 5 people and which overlooked the summit and the surrounding area. On day 2, I decided to wander further up the mountain to the snow line. At this point you are around 3,200m (2 miles) altitude, so even though the path is simple to navigate, you will tire out easily. From the snowline (which also has a cafe) you can wander further up to where snow lays year round. I didn't go too far up because I didn't bring my supplies with me and was hiking alone. On the third night, my uncle and I, along with an Israeli and Swiss guy I met, decided to go back down into town. The path to and from the summit is very easy to navigate with a full moon. My hike to Triund ended up being one of my favorite trips in India. It was really nice sleeping in a cave, under a full moon, making a fire, and roasting what little food we had over it. The Swiss guy had a guitar, the Israeli guy some cards and my uncle some hash. I managed to score some home made alcohol from a Shepard and we had a great couple of nights. Those are memories I'll probably never forget. Other things to do in Dharamsala include visiting the Shiva Cafe. The Cafe is located in Bhagsu and sits right next to a beautiful waterfall. This is a popular tourist point and you can kill a few hours just walking around and relaxing next to the waterfall. You can also visit the Karmapa's palace in lower Dharamsala. 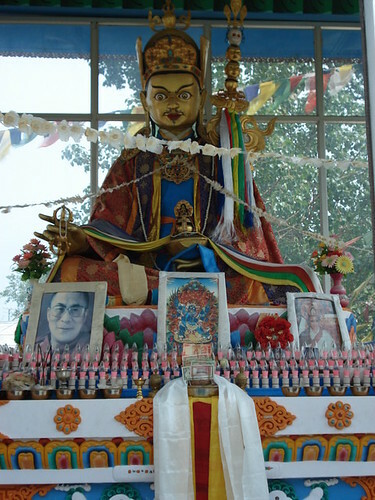 Karmapa will likely be the face of Tibetan Buddhism once the Dalai Lama passes away. It is possible to request an audience, and befriending a lama drastically increases your chances of being able to meet the Karmapa or the Dalai Lama. After about a week and a half, Dharamsala felt a little too small for a city boy like me. I met many tourists who have stayed several weeks in the town to either relax/unwind or do some volunteer work. If you are planning on doing volunteer work, it is recommended that you look well in advance. I would like to say thank you to Psomola for cooking, cleaning, and caring for me, my Popola for everything he did, Pala for showing me around, KP for taking me in, the 2 tourists I stayed in the cave with for being cool people, Norbu for coordinating everything, and all the local Tibetans who fed me, played basketball, hung out during the night, translated, and more. This special two part series on India is written and submitted by guest author Stefan K. See more of his photos from India. Please share your feedback, or interest in contributing, by leaving a comment. Those are some awesome shots, and they make me want to get out of this place called Los Angeles. After Art School is finished, I’m so getting out of this place. I found the pictures inspiring when I first saw them – I look forward to posting some more, and eventually taking my own next year!